The skipper of the St. Peters College Kemil S. Premawardana receiving the under 14 champions trophy from rugby legend Summa Navaratnam. Ltd.,). Pictures by Farook Lantra. 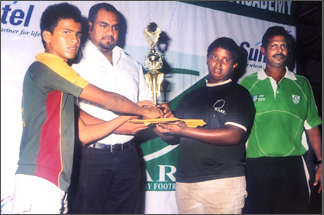 Hisham Abdeen Rugby Football Academy (HARFA) a rugby institution formed by former Havelocks Sports Club and Sri Lanka Rugby legend Hisham Abdeen held its inaugural Rugby extravaganza on February 20 in front of a capacity crowd. This tournament which was the first of its kind by HARFA featured 500 young rugby players from 36 schools and from junior age groups, which was sponsored by Suntel (Pvt) Ltd.
Around 60 events were worked off on this day, with 30 tropies awarded for the winners and runners up, for each age group such as under 10, under 12,14,16,18 and 20. Also best players awarded to all age groups. This presentation included ‘Fazal Burah trophy for the ‘Best player of the tournament, (late Fazal Burah was a founder member of HARFA). Also a trophy was awarded by Dr. Daya Athukorale for the ‘Fittest Player’ of the tournament. 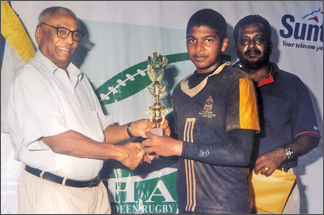 Dr. Athukorale incidently completes 20 years of distinguished service to rugby this year. The great success of this tournament was due to the services rendered by K.S.P. Karunaratne, (Sabaragamuwas RFU), Marco de Silva (Trainer HARFA), Ivor Keerthipala (Director HARFA) Comdr. H.K. Sisira rtd. (Director HARFA), Jenny Abdeen and N.J. Mudannayaka (Coordinator). Results: Under 10 Tag Rugby - Winners Joint champs Zahira College, Colombo and Zahira Mawanella. Under 12 - 10 A side Zahira College Colombo beat HARFA 24 nil. Under 14 - 10 A-side, St. Peters beat HARFA 26 nil. Under 16 - 12 A-side- Joint champs Petersons Academy and HARFA Academy. Under 18 - 10 A-side - Buddhist College, Talduwa beat Zahira Mawanella 10 nil. and under 20 - 7-a-side - HAFRA beat Buddhist College, Talduwa 5 nil.